You need in-vehicle equipment in your vehicle but you also want to stay flexible in case you need an empty loading area the next day? We’ve got the right solution for you. Easy-Klick by Sortimo – it gives you room to move. You are visiting a customer and want to have your workshop with you. 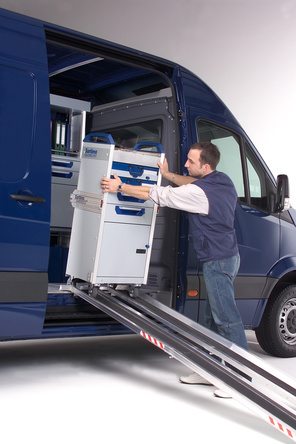 No problem: simply roll the equipment block into position inside the vehicle and “click-in” to the anchoring point. Everything is safely in place. The next day you need the vehicle for transporting bulky payloads. Very easy – simply unclick and the equipment block is released from the anchoring point, now it can be removed from your vehicle. This way you can take the equipment block with you on site and once your work is done take it to the vehicle and “click-in” again. This exchange means less standstill time, generating many individual application possibilities that can be quickly and easily realised with Sortimo.